College & engineering days use to borrow friends Yamaha 1987 RX100. Once working decided to buy one looking at my accident history and riding skills big bro and dad forced me (emotionally) to buy TVS Victor 110cc. With no Technical knowledge I agreed to buy TVS Victor thinking 110CC even TVS Shogun 110CC must be fast. But later realised Victor Max speed was 85KM/HR but somehow managed to raise the speed bar to 100km/hr. Rode it for 4 years. Got married in Dec 2005 after 6 months of marriage Samidha tells me “You look like an Elephant sitting on ANT on that bike.” Finally in Dec 2006 gifted Me Royal Enfield- Thunderbird. On my first ride to Lonavala I fell in love with her. 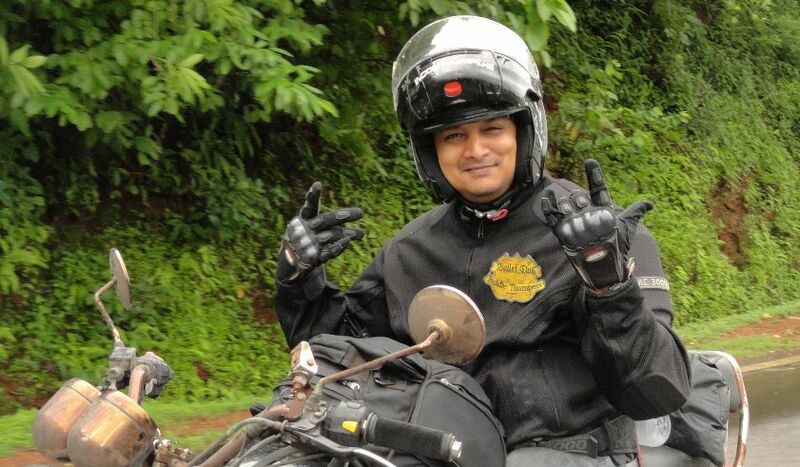 My first ride with Inddiethumpers was in July 2007 – Bhandhadara. Meet amazing riders like Dilip Sawant Aka Kaka , chinky, haresh, guru, guri, PP, Jacko and many more and journey with the club started riding to new destination and meeting more n more crazy riders like Madcat, Nihal, Ganesh , Malik, Old Crow, Shark, Ashish, Bada Rohan , Chotta Rohan, SP, Mayank. Have enjoyed each and every ride I have done with thumpers, learned lot of technical things, every ride has been new experience and bonding has increased n still increasing. Bonding in thumper family is amazing and you are not alone anywhere in this world if you are Thumper – An Inddiethumper. Favourite Rides – Goa, Khumbarli ghat , Ghat Pagal, Ride of Faith (7 times), RM 12 Delhi, RM13 Shillong.